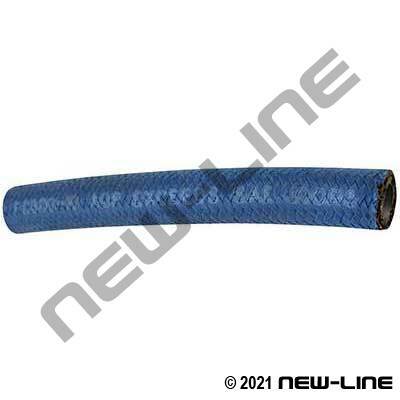 FC300 is a popular, blue textile covered SAE100R5 hose used for high temperature (hydraulic oil up to 300°F), medium pressure hose for hydraulic, air, water, gasoline, diesel, or various coolants. Due to its special AQP elastomer construction it is suitable for higher continuous operating temperatures and it is estimated it to last 5 times longer than standard SAE100R5. The external fabric braided cover permits heat loss, but it is typically not designed to withstand abrasion. FC300 meets DOT/FMVSS 106 Type A2, USCG/MMT (contact New-Line for exact approvals), AAMVA, DNV, ABS, and SAE100R5, SAEJ1019, SAEJ1402 requirements. Typical Fittings: Eaton R5 field attachables, N650xx Field attachables, Eaton R5 crimp ends with special dies. Construction: Tube: Black seamless, oil & heat resistant AQP elastomer. Cover: Blue AQP rubber impregnated with oil and weather resistant textile. Reinforcement: One textile braid & one brass plated steel wire braid. Temperature Range: -49°C (-56°F) to +150°C (302°F); air not to exceed +121°C (250°F). AQP is not rated for steam use.